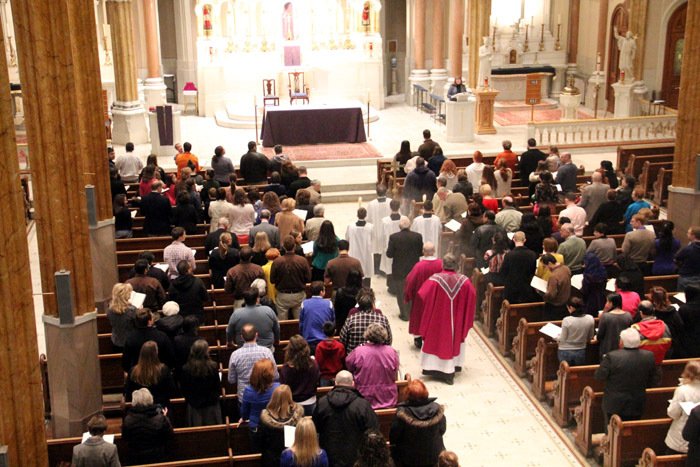 Many of the people who came to Mass Mob Philly from all over the Archdiocese of Philadelphia on Sunday, March 23 to St. Francis Xavier Church, the Oratory, were in for a pleasant surprise. They just don’t build churches as grand as St. Francis anymore. Located in the Fairmount section of the city in the shadow of the Philadelphia Museum of Art, it is itself a work of art. The problem is, it is an area that was once teeming with Catholics, most of whom have long since moved away. On a typical weekend St. Francis sees slightly less than 400 worshipers spread out over four Masses. For this special Mass, by actual count, there were 680 people in the pews. Mass Mob, a kind of “flash mob” where people plan to gather in large numbers at a predetermined time and place, was organized mostly through social media by parishioner Ben DiFrancesco, but he didn’t invent the wheel. Based on the fun concept of the flash mob, the Catholic variation was first tried in Buffalo, N.Y., as a way to encourage mostly younger Catholics to come to a special Mass that shows the church is alive and well, and filled with joy. “You only get churches like this in the city. It is good to worship in a beautiful place.” — Emily Malloy. St. Francis Xavier was almost tailor-made for the program. Although there are fewer Catholics in the area than in previous generations, new arrivals tend to be young professionals. Since 1990 the priests who staff the parish have been members of the Congregation of the Oratory of St. Philip Neri, who have made ministry to young adults a special focus. One third of the parish is the older generation, one third is young adults and one third is young married, couples, estimated Father Philip Bochanski, who celebrated the Mass. It was Father Bochanski’s hope that some of those who came for the Mass Mob will return on future weeks. “But whether they are here or in another parish, they will be taking the seed of God’s word and spreading it,” he said. “There is one universal Church and it was a universal Mass, what a beautiful thing to have,” commented Terry Leichner, who came all the way from St. Mary Parish in Schwenksville, Montgomery County, for the Mass. Mike Rafferty, a Philadelphia police sergeant, came up from St. Gabriel Parish in South Philadelphia, where he would like to see the next Mass Mob. But he is no stranger to the Oratory. Tim and Emily Malloy and their baby Gerard are parishioners, but “newbies,” Tim said. He is from Delaware County and she is from Chester County. For Emily, it is a homecoming of sorts. “My great-grandmother was married here,” she said.